The Aptina CX sensor used in the Nikon 1 series does not score that well in DxOMark testing. For example, the CX sensor in the Nikon 1 V2 DxOMark scores are 20.2 for color depth (22 is considered excellent) and 10.8 for dynamic range (12 is considered excellent). To get the best performance from a Nikon 1 camera when shooting landscape images, owners should consider using a polarizing filter. A polarizing filter changes the balance of light in a photograph and can help increase color saturation, reduce reflections, and improve shadow details. To prepare for a landscape photography presentation that I’m doing at a local art gallery, I took some sample images to help demonstrate the potential impact of a polarizing filter. I have a Nikon 77mm polarizing filter with some step-up rings which enables me to use it on a variety of lenses. I tried to find a scene with a lot of sky, water, and shadows as this combination of features can present significant challenges for a Nikon 1 camera and its small CX sensor. This first image is a straight out-of-camera JPEG, and was shot without the use of a polarizing filter. You’ll notice how flat the colors look, the lack of definition in the sky, and the lack of detail in the bark of the tree. The next image is a straight out-of-camera jpeg of the same scene, but this time it was shot with a polarizing filter. The only difference in exposure is that the shutter speed dropped from 1/250th with the first image to 1/160th with this image (using a polarizing filter blocks some light). You can see that the colors in this second image are much more saturated. It was a very windy day with aggressive wave action and the water was full of silt. This polarized image does a much better job capturing the real color of the silt-filled water along the shoreline. You’ll also notice the increased details in the bark areas of the tree, especially in shadow areas. Even if you only shoot JPEGs you can clearly see the difference that using a polarizing filter can make to your landscape images in terms of overall color balance and better definition. The next image was processed using the RAW file of the second image where the polarizing filter was used. To get the most out of RAW images with a Nikon 1 I’ve found that I typically have to be much more aggressive with CS6 adjustments. With this image I did the following: Contrast +18, Highlights -100, Shadows +44, and Black -10. In addition some small adjustments were also made using Color Efex Pro in terms of a touch more polarization and adding a bit of pro contrast. A few slight adjustments were also made with Viveza 2 in terms of brightness, contrast, structure, and shadows. When comparing these last two images I think most people would agree that it is possible to get very good landscape images using a Nikon 1. To compensate for the inherent shortcomings of the small CX sensor the key is to use a polarizing filter to capture the best digital information possible, then to process that data using the RAW file. A circular polarizing filter is very easy to use. You simply turn it either clockwise or counterclockwise and look on your rear LCD screen to see the effect that it is having on your image. Time of day, angle of the sun to the horizon and the angle of the sun to the front of your lens can all impact the degree of polarizing effect the filter will create. At times you will find no effect at all…like when the sun is directly behind you. Generally speaking, the most dramatic effects are had when the sun is at a 90-degree angle to the surface of your camera lens. You also need to be careful when using wide angle lenses, since the sky can appear unevenly colored and heavy vignetting can occur in the corners of the frame, which can be very difficult to correct in post. If you’d like a fuller explanation on the proper technique to use a polarizing filter, Nasim wrote a a detailed guide on using a polarizing filter. Nikon’s good, yes. But the world doesn’t revolve around Nikon! You’re absolutely right! There are lots of excellent cameras on the market today and buyers are fortunate to have so many great choices in gear. Very elegant reply to an inane comment, Thomas. The world does not revolve around ANY brand. Or person. I really appreciate you helping us to get more out of what we already have. I have found the images to be a bit flat and the Vivid mode to be too enthusiastic. The polariser is an interesting option. I think that you’ll find a polarizing filter can really help ‘punch up’ your images. If you watch my YouTube video I include some camera settings that I use when shooting landscapes with the Nikon 1. These can also help improve out-of-camera jpegs. Those pix really show what a polarizing filter can do. I was surprised that the polarizer effected the shadows, too. It looks like you were using a step up adapter for the polarizer. Was that just to accommodate the filter that you had, or was there a technical reason? Also, does the lack of a sun shade when using a polarizer effect the picture quality? Thanks for your posting. The improvement with shadow details is something that we often do not associate with the use of a polarizing filter…thanks for mentioning that in your post. Yes, I was using a 52-77mm step-up ring on the 6.7-13mm 1 Nikon lens I was using. That was done to accommodate the 77mm polarizing filter that I own. Using a polarizing filter with wide angle lenses can cause heavy vignetting in the corners if too much effect is dialed in. I suppose having an oversized polarizing filter on a lens may allow a photographer to dial in more polarizing effect before it becomes noticeable in the corners of a wide angle image. I haven’t actually tried it to see if this is the case or not. Maybe some other readers have some experience in this regard that they could share. Other than having to be more careful with potential lens flare I haven’t noticed any difference in image quality not having the lens hood on when shooting with a polarizing filter. Nice article and polarising filters can make all the difference. However (unless I missed it) it’s worth mentioning that cheap filters on digital camera can send metering and focus all over the place, even if it looks ok in the viewfinder. Beware. You are absolutely right, when it comes to filters quality does matter and it pays to spend money on good quality filters. Nasim recently published an article about the differences between high quality filters and cheap filters and how they impact image quality. Unfortunately I found this out the hard way and need to save for a good one now! Interesting you mention DxOMark with this camera. I use an Olympus XZ-1 much of the time as it can be in my pocket at all times. It tests badly too but can help create some great images. Each to their own & budget I guess. There is no such thing as the ‘perfect camera’….regardless of the cost every camera comes with advantages and disadvantages. I think the most important thing for us all to do as photographers is simply to get out and have fun shooting a lot of images…push our creativity…and learn how to get the most out of the gear we own. What was used to capture an image from an equipment standpoint isn’t nearly as important as what an image communicates to us and how it makes us feel. Couldn’t agree more. My little Olympus (having tried a few of the older ‘enthusiast’ compacts to carry around) lets me do lots of things that my SLR won’t as I don’t have the budget for the lens etc to the same thing. I’m thinking particularly macro-ish pics where the very close focus and fast lens is great. Of course for capturing fast moving subjects or anything other than extreme close up the SLR is more versatile when I can carry it. However neither camera will capture anything particularly special without a good brain operating it and to develop that we need to practise and not spend time looking for the next bit of kit. Tom – Love the insights you offer. As an owner of a V-1 and an AW1 I am always interested in tweaking them and seeing what happens. Can you point me in the right direction to find the step up rings please. Also how do they attached to the Nikon 1 lenses? Thanks for your comment…..glad you liked the article. Step-up rings thread onto the end of your lens just like a UV filter does. Then, you thread your polarizing filter, neutral density filter etc. onto the step up ring. As far as using step up rings on Nikon 1 lenses….I’m not sure which ones you have. I typically use my 77mm Nikon polarizing filter on the 6.7-13mm zoom and the 10-100 PD zoom. I use a 52-77 step up filter on the small zoom and a 72-77 step up for the PD zoom. For smaller 1 Nikon lenses I have to combine step up rings…I have a 40.5-52 and a 52-77 which I screw together, than put the 77mm polarizer on the end. This combination looks very weird! But, it does work. As far as polarizing filters go, I would not recommend ever buying a cheap one. When it comes to filters you really do get what you pay for. I have a Nikon 77mm polarizing filter which does a good job for me. Other good brands are B+W, Heliopan and some of the Hoyas are pretty good as well. Marumi also makes one, although I haven’t tried it specifically. I do have a Marumi variable density filter that has done a good job for me. I would definitely recommend buying some filter wrenches as it can be a huge pain to get step up rings and filters to separate at times. I’m not sure if you also have any DX or FX bodies/lenses. If you do you may want to get a polarizing filter large enough for your DX and FX lenses…then use step up rings to get it to fit on your Nikon 1 lenses. Tom – A note of caution to using step up rings on the AW1 using the underwater lenses. The front bezel of the lens has a rubberized ring that causes the receiving threads to be recessed in and the threads on the step up rings will not reach. They are however fine on the non-weatherized lenses. Excellent point…thanks for brining it up! I do not own the AW1 and I did not think about differences between the two types of 1 Nikon lenses. I have a suggestion when using a polarizer with a mirrorless camera (or live view with a DSLR.) When the camera is in auto mode, many EVF/LCD viewing systems constantly adjust the viewing brightness to keep it at the same level. This can make it hard to assess the effect of turning the polarizer for increased sky saturation. (It is not usually a problem to see removed reflections.) To overcome this EVF/LCD behavior, I lock the exposure with the AEL button or a half-press of the shutter release, then I rotate the polarizer until I see the desired effect (I usually want maximum.) Then, I release the AEL and re-evaluate the exposure, add EV compensation, etc. 1. I believe the main differences seen in the tree’s bark might simply be due to the increased exposure time. As you put it, the slower shutter speed is due to absorption by the polarizer filter. Exposures of a scene of interest through a good ND filter and a polarizer could be compared I guess. you’re point, that vignetting will take place with an undersized polarizing filter, is well taken. Vignetting of course will also happen with, say, an undersized ND filter and it is the reason why having an undersized filter should be avoided. A thin mount filter is also preferrable for the same reason. The point is, vignetting (in this case) is a result of any undersized filter. However I feel that an oversized polarizing filter will NOT help you in dialing in a greater effect on the picture (by rotating the polarizer). On a *good*, reputable brand polarizing filter, the effect should not be very large across the frame. What CAN happen though is that, using a polarizer with a relatively wide angle lens, the dialed in effect would change across the frame for the following reason. I couldn’t find the lens you used for the pics in your text. Judging by the camera/lens photo, it appears to have been a 6.7-13mm Nikkor 1 lens – please correct me. If this lens is used @10mm say, the crop factor will provide a 27mm (35mm equiv) Field of View; in turn this will give you some 65 degree FOV on the pic longest dimension. Now this may give you a different effect on the blue sky (say) as the angle between the Sun and the sky will change significantly across the pic. In fact, your nice pic appears to show some of this effect; if one compares the blue of the sky near the left edge it seems different from the sky seen through the rightmost space between the tree trunks (perhaps the effect is masked a bit by the clouds there). Using a polarizer with a relatively wide lens might give you that (usually) unwanted effect on a blue sky, regardless of the polarizer side I’m afraid. Thanks very much for your detailed posting….very much appreciated. I used the 6.7-13 lens as your post noted. The image in my article was taken at 7mm…[email protected] f/5.6. I am very intrigued with your comment about a slight change in shutter speed possibly contributing to the extra detail in the bark. I’m going to try and find some time this weekend to test that out a bit more. isn’t very clear, sorry. I actually meant that a good polarizing filter should be reasonably homogeneous across its surface so as to provide the same polarizing effect over the frame. This means that, if you have a polarizing filter that is large enough to just avoid any vignetting, it should provide the same image as an identical filter but which is larger in size. I did a few tests with a variable neutral density filter so see the effects of a slower shutter speed on the detail in the bark of tree etc. I did detect some differences but they were not as dramatic as the differences seen with the use of polarizing filter. It appears that the increased detail in the tree bark was caused by a combination of using a slower shutter speed and the polarizing filter. I know this post is a couple of weeks old but wanted to throw my theory on why there’s more details on the shadows. Since the amount of light the polariser filters varies according to the type of light, I would say that it is filtering more light from other areas of the image (sky, water) and less from the tree. For the image as a whole a longer shutter speed is needed, but there’s an actually gain in the amount of light received from the shadows. Thanks for your comment. Pixel size and density is certainly a concern for many photographers and many folks share your concerns about the Nikon 1 and its CX sensor. For many folks it is a ‘deal breaker’ and they would not consider buying one. Based on DxOMark scores Nikon seems to have found a way to maintain a fairly consistent level of performance with the Aptina CX sensors while increasing pixel density….although their overall performance obviously falls short of current micro 4/3 and crop sensor cameras. It is interesting that even though the V3 has almost an 80% increase in pixels over the V1 the DxOMark scores are close enough between the cameras that users will likely not notice any significant difference in image quality. (DxOMark notes that a difference of 1.0 on colour depth is needed to be noticeable, and a 0.5 difference is needed on dynamic range). It will be interesting to see how the V3 performs with its 18.4 MP sensor with no low pass filter. I should be getting mine in about 10 days or so and will be doing a hands-on review here at Photography Life. I actually quite like the Nikon 1 cameras for video and I use them all the time along with my D800 when doing client work. When it comes to taking stills for clients I only use my D800. On a completely unrelated note to this post I was wondering if you’re going to be doing a workshop at GPL again, I was disappointed that I couldn’t attend tonight and was looking forward to what you had to teach. My introduction to landscape photography workshop presentation at the Grimsby Art Gallery was rescheduled to Thursday June 26th. Hope to see you then! 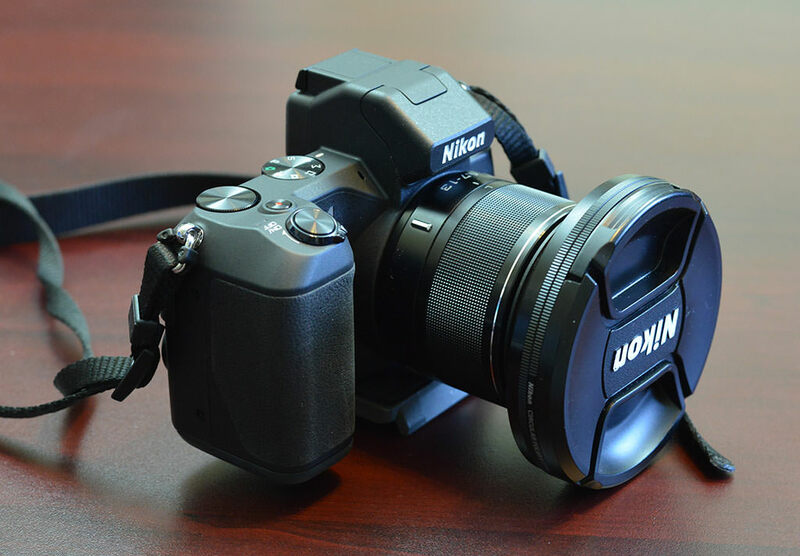 I have the Nikon 1 S1 – been using it with mixed success since November 2013. I’m now looking to use some filters and I have a great supply of Cokin filters going back many years (all used on various very old Pentax cameras including the trusty K1000) – do you know if there is an adaptor/convertor for the Cokin product to fit the standard Nikor 11 – 27.5 lens I have on my 1 S1? If there is no such goodie (what a pity) can you advise on the exact polarizing lens spec I would need for my little Nikon? Many thanks. I use a Nikon circular 77mm polarizing filter for all of my lenses (FX and 1 Nikon)….and use step-up rings to get it to fit rather than buying additional polarizers. Thanks for the comment and for sharing your Nikon 1 experiences! I don’t have any grandchildren yet, but if we are so blessed I’m hoping to nurture any potential interest in photography they may have.